It gives me great pleasure to be present here for the Convocation of Ganesh Shankar Vidyarthi Memorial Medical College. I am honoured to be in this institution whose foundation was laid in 1956 by our country’s first President, Dr. Rajendra Prasad. This Medical College was established in the memory of Late Shri Ganesh Shankar Vidyarthi, who was a freedom fighter and a learned journalist. A staunch advocate of social justice, he was a crusader for the oppressed. Through ‘Pratap’, a revolutionary weekly that he had founded, he fought for the exploited peasants and mill workers. He sacrificed his life for the nation at the young age of forty years. I pay my homage to this noble son of India. This Medical College should be guided by the ideals he stood for. This Institute was the first medical college to be set up in Uttar Pradesh after our country’s Independence. It was created to develop postgraduate medical education and to produce specialists in several medical disciplines. It is today known for its academic excellence and comprehensive patient care facilities. Those associated with its establishment and growth should have a justifiable sense of pride and satisfaction. Health is an important indicator of any country’s progress. Unless citizens enjoy good health, their productive potential cannot be unleashed fully. Lord Gautam Buddha said and I quote: "To keep the body in good health is a duty... otherwise we shall not be able to keep our mind strong and clear” (unquote). A healthy population possesses a greater capacity to access education, knowledge and employment opportunities. The health status of our population has improved substantially over the years. But, we are still short of our goals. The infant mortality rate is high at 44 per 1000 live births, while the maternal mortality rate is also high at 212 per 1 lakh live births. We have envisaged reducing infant mortality rate to 25 and maternal mortality rate to 100 by the end of the Twelfth Plan period. We must increase our focus on those states that are lagging behind. The role of Institutes like yours will be crucial in strengthening the health system in the country. Availability, quality and affordability are the three cornerstones of a sound healthcare system. The National Rural Health Mission, launched in 2005, was a landmark initiative aimed at restructuring health service in our country. It was designed to take healthcare to the doorstep of the rural population through a network of sub-centres, primary health centres and community health centres. I am happy to note the positive results of this Mission. It has created a huge infrastructure of 1.8 lakh health centres in the country. This Mission has also added over 1.4 lakh healthcare personnel in the system. Availability of better infrastructure, trained manpower, effective drugs and modern equipment has led to significant improvement in service delivery. But much more needs to be done. A new National Health Mission, combining the rural mission and a new urban mission, is being launched with an outlay of over Rs. 21,000 crore for 2013-14. There is a need to increase spending on health to augment health services in our country. Public expenditure on health in India is 1.2 per cent of its GDP. This is much lower than the 4 per cent plus level in countries like US, UK, Australia, Norway and Brazil. Public sector spending is constrained by competing needs. We must therefore encourage increased participation of private healthcare providers. We must develop innovative models to engage them in imparting quality healthcare services. For universal health coverage, affordability is crucial. Expensive medical treatment can be burdensome for people, especially for the poor. In fact, many descend into poverty on account of that. High costs effectively deny many people of specialty medical treatment. This scenario should be rectified by strengthening the health insurance mechanism. The Rashtriya Swasthya Bima Yojana gives beneficiaries cash less in-patient treatment. Its scope should be widened to provide the insured access to comprehensive primary, secondary and tertiary medical care. We must ensure its coverage to every one below the poverty line. Our health coverage strategy should look beyond medical cure and intervention. Preventive healthcare is relevant in a country like India where lifestyle diseases have shown a rising trend. Our health system must, therefore, be equipped to not only treat people but also guide them about prevention of these medical conditions. Hygiene and sanitation also play a critical role in preventing diseases. To ensure that efforts in this direction are effective, we must encourage the active participation of local participatory bodies. The use of technology in healthcare should be fully recognized. Using satellite technology, the telemedicine project has connected remote health centres with super specialty hospitals in urban areas and helped expert healthcare consultation to reach the needy and under-served people. More uses of technology in healthcare should be explored. We have to find effective and inexpensive cure for many diseases. To reduce our reliance on costly imported equipments for medical procedures, there is a need to develop such instruments indigenously. The Science, Technology and Innovation Policy, 2013 seeks to give a major push to our country’s development through innovation. This policy should be leveraged by our medical schools, research laboratories, and the pharmaceutical and instrumentation industries to develop better formulations and make sophisticated medical instruments. The innovations taking place in our hospitals and medical colleges must be recognized to provide encouragement for such activity. Quality healthcare services require adequate number of competent healthcare professionals. There were about 241 medical professionals – physicians, dentists, nurses, pharmacists and others – per one lakh population in 2011-12. We hope to increase the density of such medical professionals to 354 by the end of the Twelfth Plan. This calls for setting up more institutes for quality medical education. 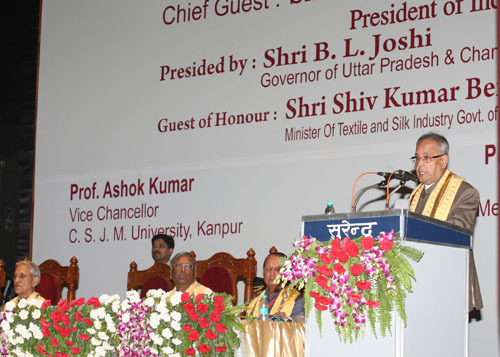 It is good that six AIIMS like institutions are being set up to give impetus to such efforts. There is also a need to increase the capacity of our existing medical schools and nursing colleges and enhance their standards. I am confident that our public medical colleges will be able to meet the twin challenge of greater quantity and better quality. The success of our healthcare system will depend on the competency, commitment and dedication of our doctors and other medical professionals. Medical institutions like yours should give a serious thought to the kind of health system that our country should have. Whether we possess a fully commercial system based on profit incentive or a one responsive to our socio-economic conditions depends on the kind of value education that you will inculcate in the students. I call upon you to build in the minds of the young doctors a strong sense of patriotism and social responsibility. The urge for our young doctors to undergo higher studies in premier institutions abroad to acquire greater expertise and widen their horizon is easily understandable. But they should retain the sacred link with their own motherland. We must find ways to enable such meritorious and qualified doctors to contribute to national welfare. Medicine is a profession respected by all in society. Doctors are given a place next to God. I am sure our medical fraternity will respect the good faith and trust that people have bestowed upon them. Doctors entering the profession are administered the Hippocratic Oath. It is necessary to instill in the young minds the true meaning of this oath. The medical institutions therefore have a duty to infuse the notions of ethical behaviour in their students. I congratulate the students who have received their degrees today. Your professional degree has empowered you to contribute to the nation, to touch and transform the lives of millions. I hope that you will remain firm in your conviction to the higher objective of selfless service to society. I wish you all success in life and career. I also wish the doctors, faculty members and others working in this great institute every success in their endeavours.